Warning to remain in place until Sunday morning. 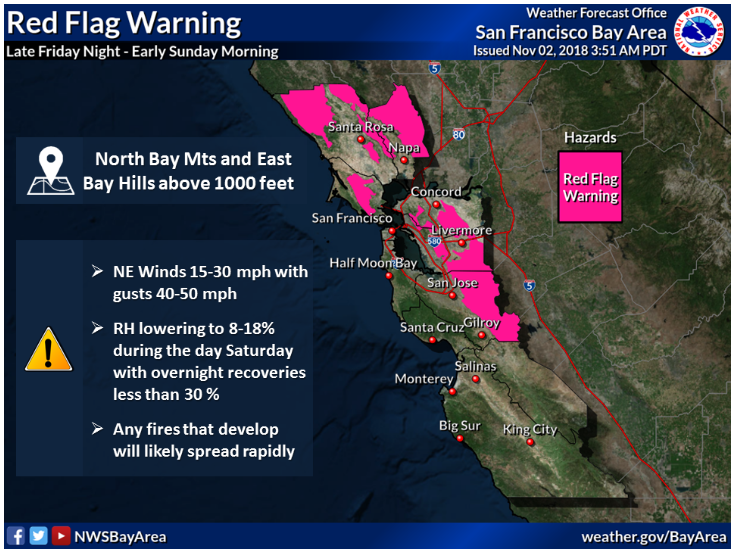 Marin County, CA — The National Weather Service has issued a Red Flag Warning for the North Bay Mountains and other parts of the Bay Area, which is in effect from 1 AM Saturday to 6 AM Sunday, November 4th. A Red Flag Warning means that critical fire weather conditions are expected during this time frame with a combination of strong North East winds with gusts to 60 miles per hour and low relative humidity. The affected area includes higher terrain areas of Marin, Napa, Sonoma counties above 1,000 feet.